Dr. Christopher is Assistant Professor, Department of Psychiatry and Human Behavior, and Taylor Stayton is a medical student, Alpert Medical School, Brown University, Providence, RI. Dr. Pinals is Assistant Commissioner, Forensic Services, and Mr. Blumberg is General Counsel, Massachusetts Department of Mental Health, Boston, MA. Dr. Pinals is also Associate Professor, Department of Psychiatry, University of Massachusetts Medical School, Worcester, MA. Ms. Sanders is a trial attorney, Committee for Public Counsel Services, Greater Boston Area, Boston, MA. Early study results were presented at the 164th Annual Meeting of the American Psychiatric Association in May 2011 and the 43rd Annual Meeting of the American Academy of Psychiatry and the Law in October 2012. Dr. Christopher received funding from NIDA (K23 DA034030). Substance abuse is a leading cause of morbidity and mortality in the United States. Although civil commitment has been used to address substance abuse for more than a century, little is known today about the nature and use of substance-related commitment laws in the United States. We examined statutes between July 2010 and October 2012 from all 50 states and the District of Columbia for provisions authorizing civil commitment of adults for substance abuse and recorded the criteria and evidentiary standard for commitment and the location and the maximum duration of commitment orders. High-level state representatives evaluated these data and provided information on the use of commitment. Thirty-three states have statutory provisions for the civil commitment of persons because of substance abuse. The application of these statutes ranged from a few commitment cases to thousands annually. Although dangerousness was the most common basis for commitment, many states permitted it in other contexts. The maximum duration of treatment ranged from less than 1 month to more than 1 year for both initial and subsequent civil commitment orders. These findings show wide variability in the nature and application of civil commitment statutes for substance abuse in the United States. Such diversity reflects a lack of consensus on the role that civil commitment should play in managing substance abuse and the problems associated with it. Outside of a criminal justice context, broad support for substance-related civil commitment is lacking.18 Ideological, administrative, and economic barriers hamper successful implementation of substance commitment statutes. Reasons include a reluctance to restrict autonomy through formal mechanisms of social control, particularly in settings where access to voluntary addiction treatments is limited, as it would seem to coerce care unfairly; uncertainty over what treatment strategies to use for committed individuals; and the appropriate payer for treatment during commitment.19,20 Despite its longstanding existence, surprisingly little is known about the extent to which substance-related commitment is used, even within jurisdictions that authorize it. Thus, in the present study, we examined the nature and utilization of modern U.S. substance-specific civil commitment laws. 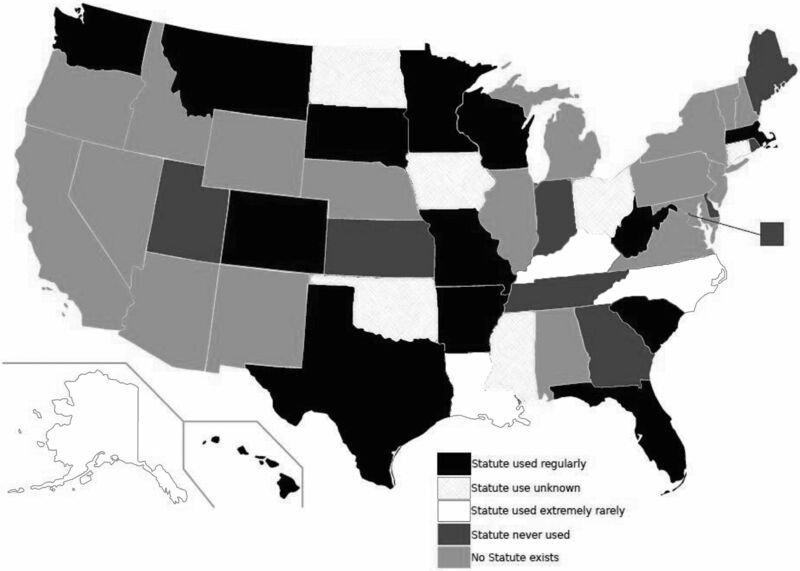 From July 2010 through October 2012, statutes for the 50 states and the District of Columbia (hereafter, the states) were examined to identify provisions allowing for civil commitment of adults (18 years and older) because of substance abuse alone (i.e., independent of mental illness, unless substance disorders are included in a statute's definition of mental illness) and outside a criminal justice context (i.e., did not require a concomitant criminal justice case). Statutes were accessed from the official website of each state government. Each statute was searched using the terms “commitment,” “drug,” “alcohol,” and “substance.” For statutes in which no substance-related commitment provision was identified, the mental health commitment section was examined to determine whether substance abuse was included under the definition of mental illness. If substance abuse was not defined under mental illness, remaining sections, chapters, and subchapter headings of the entire statute were examined for language relevant to a provision for substance-based commitment. pregnant and abusing substances, and past treatment failure (having failed to maintain sobriety after substance abuse treatment). The accuracy of our statutory readings and data on commitment utilization was then evaluated by high-level state representatives. We first contacted the director or head of each state department of behavioral health or substance abuse services (or equivalent), who either responded to our inquiry directly or referred us to the head of the state-run substance abuse treatment service or a similar authority. If no response was received from the director, we contacted the head of forensic mental health. If this attempt failed, we contacted the head of the legal services division for the department of behavioral health or substance abuse (or equivalent). All states responded to our request. Each representative verified the accuracy of our data and provided a specific or estimated count of annual cases of substance-related civil commitment or, if no count was available, indicated whether the statute was active and applied, never applied, or applied only under extremely rare circumstances (e.g., may be used in exceptional cases but is generally considered inapplicable). Statutes were coded as “extent of use unknown” if no count was available and the representative could not estimate the extent of use. Each representative was also invited to comment on factors that influenced the extent of the statute's use in real-world practice. This study did not involve human subjects and was deemed not to be subject to review or exemption by the Institutional Review Board of the University of Massachusetts Medical School and the Central Office Research Review Committee of the Massachusetts Department of Mental Health. Thirty-three of the 51 states (including the District of Columbia) have a statutory provision authorizing civil commitment of adults for substance abuse (Fig. 1). Of these, 9 states never apply and 4 more very rarely apply their statutes. Existence and utilization of civil commitment statutes for substance abuse in the United States July 2010 through October 2012. Of the remaining 20 states, 7 provided utilization data for the most recent available year(s): Colorado: 150–200 (annual average); Florida: >9,000 (annual average); Hawaii: 83 in 2009; Massachusetts: >4,500 (annual average) around 2011; Missouri: 166 in 2011; Texas: 22 in 2010; and Wisconsin: 260 in 2011. Seven other states reported that commitment occurred regularly or frequently, but could not provide a specific or estimated count, typically because data were not recorded in a central location (i.e., they were either collected by county, by individual courts, or not at all). The remaining 6 states, although familiar with the statute, were unable to report the extent of the statute's use (Fig. 1). Statutes vary on the substantive criteria used to justify commitment (Table 1). Dangerousness to self and to others is the most frequently included ground for commitment. States commonly permit commitment under alternative circumstances, with the necessary and sufficient criteria set differing by state. The evidentiary requirement (before judicial approval for commitment can be given) for these criteria also varies by state (Table 1). The maximum periods for both initial and subsequent commitment orders range from a month or shorter to a year or longer. Some states allow commitment only to an inpatient facility and others to inpatient and outpatient facilities and programs; others do not specify the setting (Table 2). This is the first comprehensive examination of the nature and utilization of civil commitment laws for substance abuse in the United States. These data show that outside of the criminal justice system, states hold markedly different views toward compulsory treatment for substance abuse. This study examined statutes from July 2010 through October 2012. Our findings suggest a small increase in the number of states with civil commitment statutes in recent decades (33 compared with 31 in 1997).10 We note our findings of the existence of substance-related commitment statutes differs from those in a recent study that identified only 17 states with commitment statutes; we suspect these differences arose from that study's having restricted the investigation to the mental health sections of statutes,12 whereas our search included the entire statue, as well as contact with an authority within the state to confirm our findings. Notably, many of the statutes that we identified were found in sections of other statutes (e.g., penal code, welfare) that were separate from mental health codes. For example, Florida, which was found to have among the highest utilization of civil commitment for substance abuse, was not identified in the prior study, most likely because its provision fell under the public health section of the statute. Although more than half of states have statutory provisions that seem to allow for civil commitment for substance abuse, it is important to note that many of these statutes have fallen into disuse. The reported reasons for nonuse varied. In Indiana, for example, the statutorily designated facility for substance commitments is no longer in operation; thus, although the statute appears to be active, its wording does not permit commitment to any other private or publicly funded entity. In other states, petitions for commitment do not have adequate support from the attorney general or judiciary. Although not specifically offered by state representatives as a reason for not using a statute, state-specific case law may further restrict commitment applications in some jurisdictions. One example from Louisiana, where substance-related commitment is extremely rare, is In the Matter of M.M.,21 in which the Second Circuit Court of Appeals overturned the commitment of a man who was abusing alcohol, cannabis, alprazolam, and phenobarbital. The court held that the petition for M.M. 's commitment failed to meet the threshold of clear and convincing evidence that he posed a danger or was gravely disabled despite his self-report of heavy alcohol use, his multiple recent charges of driving under the influence, verbal altercations with his mother, suicidality, and refusal of treatment. Meanwhile, in states such as Florida and Massachusetts, commitment for substance abuse is used frequently. Three states changed their commitment laws during this study: in 2012, Ohio revised its statute to permit substance-related commitment, California repealed its provision, and Massachusetts extended its maximum commitment duration from 30 to 90 days. Similarly, it is conceivable that additional statutory modifications could have taken place between the time of writing and the publication of this paper. Nearly all states with substance-related commitment statutes allow commitment of persons who, due to their substance abuse, pose a significant and often immediate threat of harm to themselves or others. Many also allow commitment under other circumstances including grave disability, loss of self-control or decisional capacity, and dangerousness to property or a fetus. A remarkable finding was that more than half of statutes allow commitment on the basis of substance abuse alone—that is, in the absence of additional clinical, legal, or social factors. These alternative pathways suggest that statutes were formulated to allow for a certain degree of flexibility in bringing persons with substance abuse into treatment in light of the variety of ways in which severe substance use can impair judgment and threaten personal and public safety. Although these data do not reveal the relative frequency with which any single criterion serves as the substantive basis for commitments in a given state, select criteria (for example, those relating to dangerousness) may play a more common role as grounds for commitment.15 Nevertheless, given the concern for misuse and abuse of substance use commitment within jurisdictions where it is more widely accepted,22 research is needed to examine further what criteria are used to justify commitments and whether specific criteria predict short- and long-term outcomes after commitment. Attention should also be paid to possible differences in how commitment laws are applied between jurisdictions within a particular state, especially given the variability in services and the individual approaches of the parties who may be involved in the commitment process (e.g., police, judges, drug court personnel, attorneys, community treatment providers, and correctional systems). Undoubtedly, the criminal justice system serves as an alternative route for bringing individuals with substance abuse problems into compulsory treatment. The rates of substance addiction are at least twice as high in criminal justice–involved populations, including probation, parole, and incarceration24,25, as the general population. In recent decades, there has been a shift among European countries toward using commitment in a criminal justice rather than purely civil context.26 Early research on substance commitment in the United Sates focused on populations under community-based correctional supervision,27 both because most committed individuals had active or past criminal justice problems, and because mid-20th century commitment laws related to substance use were largely introduced as an alternative to criminal sentencing.28 Little is known about the extent of criminal justice problems among those who are civilly committed for substance abuse in the United States today. Drug courts have achieved widespread integration into the criminal justice system and offer alternatives to incarceration for defendants with substance use problems.29 They may operate concomitantly with civil commitment for individuals facing criminal charges. This interface merits exploration. Future inquiry should also address whether identifiable factors predict who gets committed, including socioeconomic status, health insurance, unemployment, and membership in a particular ethnic or racial group, as has been found with mental health commitment.30 Such factors, if they exist, would call into question whether civil commitment should be used to deal with problems that arise from social determinants of health. Despite the longstanding existence of civil commitment for substance abuse, data on short- and long-term outcomes following commitment are surprisingly limited, outdated, and conflicting.26,31,–,33 On balance, the recent evidence suggests that commitment does little to deter future substance abuse7,18,34 for several reasons. First, the treatment offered during commitment varies by setting, jurisdiction, and length of commitment. Second, sustained abstinence from substances of abuse is consistently predicted by a patient's motivation to sustain abstinence, demonstration of self-help behavior and beliefs, and perceived self-efficacy.35,–,37 Because of its compulsory nature, civil commitment may seem to oppose such positive prognostic factors. However, research is needed on the extent to which the subjective experience of coercion impedes development of internal motivation,38 even when the treatment offered under commitment includes strategies designed to mitigate these effects. Some committed individuals paradoxically experience mandated treatment as welcome and potentially beneficial.39,40 Thus, the interplay between coercion and satisfaction at having access to substance abuse treatment warrants further consideration. Specifically, such research should include simultaneous assessment of the range of additional pressures that may coexist with a commitment order (e.g., urging of family and employers), one's perceptions of such pressures,21 changes in motivation during the commitment period, the severity and treatment of co-occurring disorders, and the aforementioned potential social determinants of substance outcomes (e.g., insurance status, financial resources, and social supports). These data could provide an important evidence base for evaluating the ethics-related tensions between promoting safety and patient autonomy that invariably accompany civil commitment laws. Several limitations in our study should be noted. Although we sought to determine to what extent statutes were used in the states in which they exist, often state representatives could offer only limited information on their use; thus, the detail and quality of data on commitment varied by state. Moreover, the existence of any particular statute does not necessarily reflect how it is used in real-world settings. Some states may not make use of commitment statutes because of bed availability or other reasons. Even in states where commitment periods can be long, the order may call for a shorter period, or individuals may be released before completing the full term of the commitment.15 Moreover, these data do not answer important questions about the type of treatment provided under commitments and the coordination of care between providers in commitment and noncommitment settings. Also, although these data suggest a slight increase in the existence of substance-related commitment laws over time, they do not offer information about year-to-year variations in utilization or statutory development within states. Given the significance and extent of substance abuse and the potential benefit of civil commitment, more attention should be given to this topic. Disclosures of financial or other potential conflicts of interest: The opinions expressed in this article are the authors' and do not reflect the views or opinions of any agency or entity with which the authors are affiliated. In the Matter of M.M., 969 So. 2d 835 (La. Ct. App. 2007).